Mapping Latino Populations in the U.S.
Use our resources to better understand population density and distribution patterns. The Atlantic blog and Pew Research study analyze U.S. Census data about “Hispanic or Latino” populations. How do you define Hispanic or Latino? Hispanic generally refers to people tracing their ancestry to the Iberian Peninsula, dominated by Spain and Portugal. Latina/o generally refers to people tracing their ancestry to Latin America—Mexico, the Caribbean, Central America, and South America. “Latina/o” can indicate people who trace their ancestry to Europe (Hispanic), as well as people of indigenous American origin. Due to the complex history of immigration in Latin America and debate in the community over which term to use, the U.S. Census sometimes groups Hispanics and Latinos together. FYI: Hispanic and Latino are ethonyms. An ethonym is a name applied to or used by an ethnic group. People native to Italy, for example, use the ethonym Italian. People native to the China use the ethonym Chinese. Just to make it interesting (and confusing), ethonyms are not quite the same as demonyms. Demonyms are names applied to or used by people from a certain place, not having to do with their ethnicity. People from Los Angeles, for example, use the the demonym Angeleno. An Angeleno may also identify by an ethonym, such as African-American, Latina/o, or Asian. Our multi-ethnic society includes even more specific ethonyms and demonyms—Afro-Cuban Angelenos, for instance. Sometimes, an immigrant group identifies itself as a unique community in its adopted home, combining ethonyms and demonyms. The New York area’s Puerto Rican community, for example, sometimes identifies as Nuyorican. Click through the U.S. Census maps of “Hispanic or Latino Population by Specific Origin.” Which Hispanic or Latino populations are the largest in the U.S.? They’re actually listed in order: Mexican (31.8 million), Puerto Rican (4.6 million), and Cuban (1.8 million). Does your state have a greater density of any ethnicity than the U.S. as a whole? Is the density of any ethnicity less in your state than the U.S. as a whole? Read through our activity “Comparing Density and Distribution.” Review the excellent questions explored in the section “Testing the Definitions,” using the state-by-state data linked to above. What is the difference between density and distribution? What is the population density in your state? Do you think your state’s population is evenly distributed throughout the state? Do you think the population density of a specific ethnic group (such as Hispanics or Latinos) is evenly distributed throughout the state? How do the new U.S. Census maps of “Hispanic or Latino Population by Specific Origin” provide more information than the state-by-state data table linked to above? The new maps provide more information in two important ways. First, the new maps provide more specific distribution patterns. The population density of Latinos is higher in California than the U.S. in general, for instance. (That information is available in the table.) The distribution pattern revealed in the new maps shows that that population is largely clustered in the southern part of the state. Counties in California’s far north may have more in common demographically with Wyoming than counties in California’s south. Second, the new maps offer more information on specific groups. 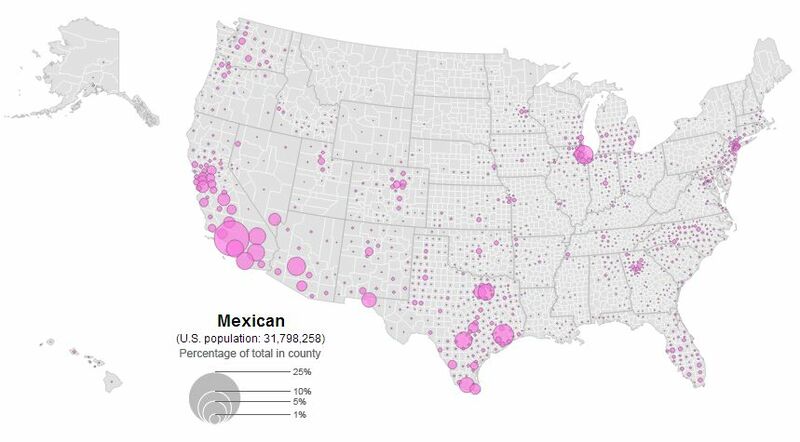 The state Census data displays “Hispanic or Latino” only, while the new maps break that category down into 22 different identities, with radically different distribution patterns. While California and Texas have the largest concentrations of Hispanic or Latino populations in the country, and New Mexico has the largest concentration of Hispanics or Latinos as a percentage of state population, not one county in any of those states has a significant population of Paraguayans, for instance. The American Paraguayan presence is clustered around New York City. Could data be even more specific than the “Hispanic or Latino Population by Specific Origin” maps? Do you think Hispanic or Latino populations are evenly distributed in the urban areas identified in the maps, such as Los Angeles, Miami, or New York? Of course maps can be more specific! Using citywide or even neighborhood population density data, statisticians/demographers could identify neighborhoods with specific ethnic populations, such as Little Havana in Miami or Little Ecuador in Minneapolis. Get ambitious! You can make maps similar to the ones from the U.S. Census, using their data. Use the drop-down menus at the top of the state data tables to drill down to a specific county or city. Then, use this awesome county-by-county map to plot the density or distribution patterns for another population demographic: age, ethnicity, education, income, etc.